1. 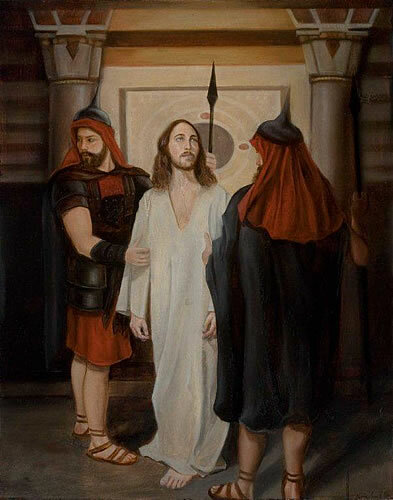 Jesus is condemned to death. It begins. After a night of drama, disappointment and betrayal, the arrest is made, the sentence stated, and the redemption begins. The price of redemption: the death of the Son of God. Jesus must now set aside His Godliness to embrace His destiny. In the next long hours Jesus will know His full humanity by being put to death in the most unimaginable way. // Dear Jesus, You made Yourself vulnerable and prepared to endure pain to save us. Thank You for submitting yourself to weakness, fear and pain. Somehow you are also calm and resolute, accepting the unjust conclusion, doing Your Father's will. Help us, human and weak, to do the same. 2. 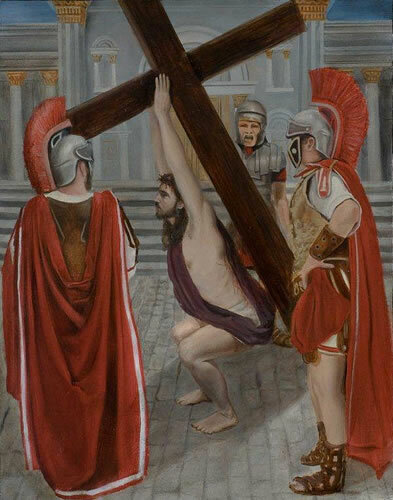 Jesus takes up His cross. Before starting the journey to Calvary, Jesus is whipped in the courtyard, and the first blood is drawn. They scourge Him and assail His body, then crown Him with a thorned wreath. Jesus bleeds more and begins to weaken. 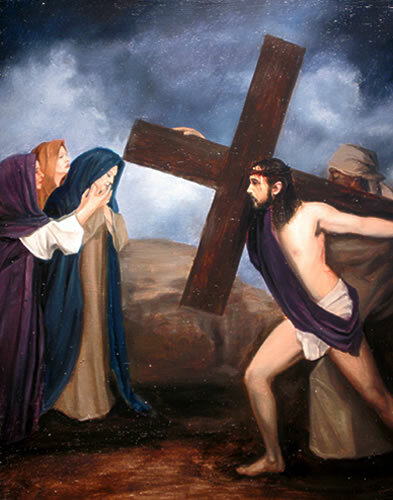 Before all of this physical abuse, bearing His cross would have been easier. Now it is a superhuman request that Jesus carry the tree up a hill. May we understand better that while our crosses are heavier when our energies and abilities are compromised, we still must bear them. // Jesus, just as You somehow summoned the strength to take up Your cross when Your wounds were fresh, help us to draw on our Your love to walk our lives' most difficult journeys. 3. Jesus falls for the first time. We don't know how far Jesus made it before He fell for the first time. But we know Jesus was walking up hill while his life force was going down. Imagine Jesus coming up quickly on a steep part of the incline and His tired body unable to compensate. Then the weight of the cross and gravity conspire to take Him down. Yet as hard as it is to stumble on a challenging path, it is even harder to restart the journey. // Jesus, did your fall surprise You? Did rising daunt You? How lonely was Your responsibility, how massive Your pain? How great Your love for us! 4. Jesus meets His mother, Mary. 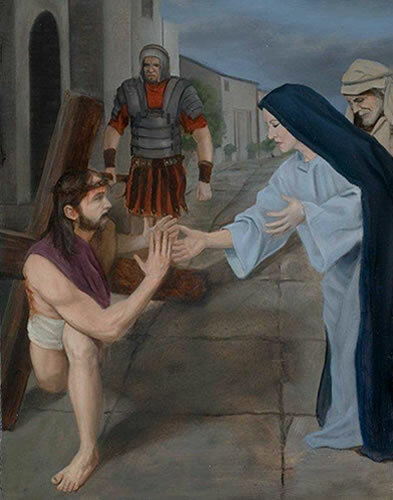 In His battered state, Jesus encounters his mother along the way. Imagine her watching his trudging walk, his fall, his further depletion. 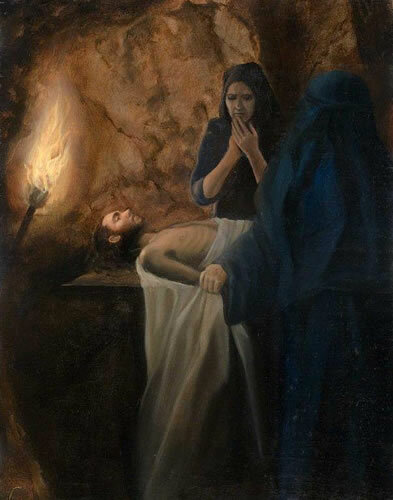 Jesus looks in His mother's eyes and sees both her sorrow and her commitment to His doing His Father's will. Just as Jesus could not cling to His Godliness in order to fulfill His destiny, Mary cannot cling to her Son's humanity. She suppresses her natural mother's outrage and draws from her trust in the Lord. Her holy love and understanding nourish Jesus and envelop Him, so that wherever He may be on the road, she will walk every step with Him. 5. 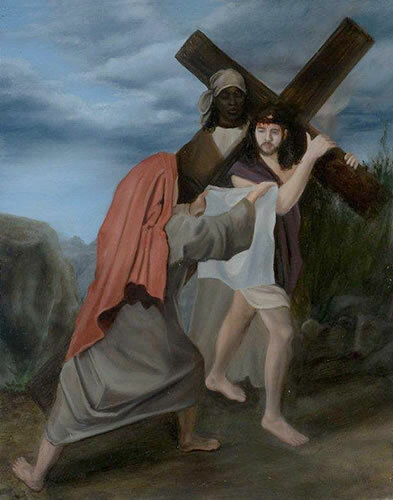 Simon helps Jesus carry His cross. Imagine walking down a side street towards the center of town to find a spectacle ahead. Then a Roman centurion presses you into service to help the man at the center of the spectacle. 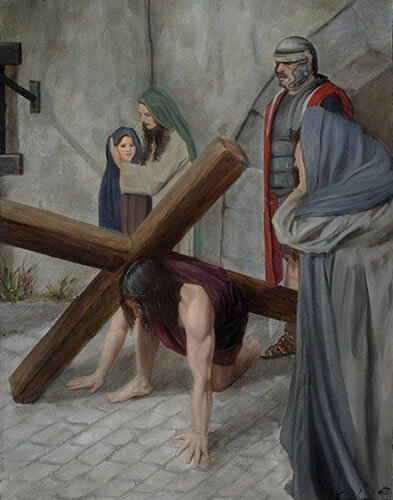 You're big and strong, so you can lift the cross to help the battered and bleeding convict. You are the person who finds himself in the thick of an emergency, the doctor on the airplane, in the wrong place at the right time. You can see that Jesus is grateful for your help. You don't know yet that you will be the person closest to Him as He walks to His destiny, or what that will mean to mankind. You just step up as the situation demands. // Jesus, help us to heed Your call, even when it seems random. Teach us that our imaginations aren't as good as Yours, and lead us to flex with the right path. 6. Veronica wipes the face of Jesus. What did Veronica see when Jesus passed her on the road? Did she see His determination as sacrifice and fortitude? Or were her eyes open so wide she could recognize His boundless love and redemptive power? Whatever she saw, Veronica saw it because she was looking for it. Moved by Jesus, she shows her empathy by gently wiping his sweat-stained face. Did Jesus feel hope for mankind as a result of Veronica's perception and compassion? // Oh, Jesus, help us to keep our eyes and ears more open to the Divine in others. Then help us to act to serve their needs. 7. Jesus falls for the second time. 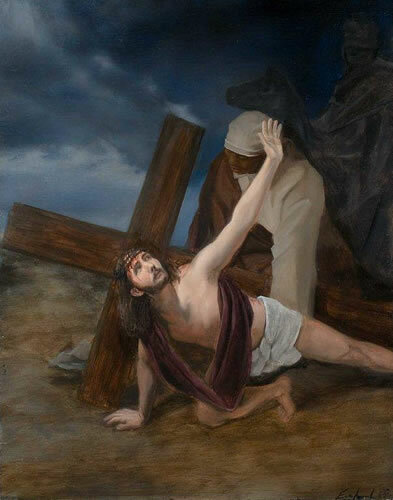 Even with Simon helping to carry the cross, Jesus falls again. Brought to His knees again, He knows He must get up, no matter the cost. 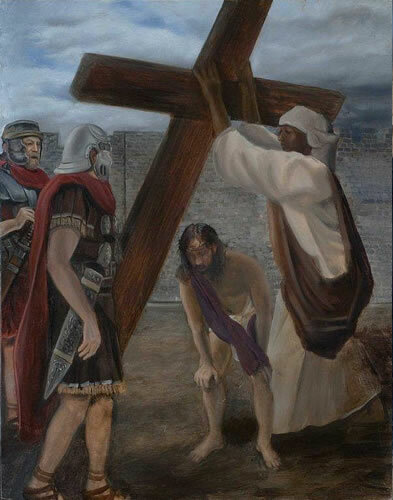 Simon helps Jesus, taking the cross away for a moment. Jesus gratefully moves out from under it, adjusts himself, and prepares to move forward again. Like Jesus, we can't pick our crosses, and sometimes they seem unbearable, even with the help of others. But we are not alone. // Jesus, help us to accept Your help and the help of others so that we can surmount the insurmountable. Help us to persevere through our trials together, to peace, to healing, and, one day, to joy. 8. Jesus meets the women of Jerusalem. The women of Jerusalem are weeping, inconsolably. They cry for the injustice to Jesus, for His pain and hardship. He's got their total attention, but for the wrong reasons. Jesus knows that His pain will end soon, but that their paths to the kingdom will be difficult. Weak himself, He still feels a great compassion for the challenges these women and their progeny will face. They will persecuted as His followers. They will struggle to understand and accept His resurrection. They will find it hard to live His word, as His way is not the world's way. // Jesus, help us in our day to be Your people and live Your word and way. 9. Jesus Falls for the Third Time. When Jesus falls for the third time, everyone assumes He will not get up. They know that Jesus is weak. They know that He is near the last. They don't know the depths of His spirit. They don't yet recognize that Jesus' spirit is boundless and His destiny is real. It's like when you're counted down and no one else can see the best in you. The crowd and the soldiers could not understand that He was Jesus the Lord, who would save us all. Jesus knew that and simply drew from His powerful spirit. He knew in order to save us He had to be crucified. In order to be crucified He had to get there. // Jesus, thank you for getting there. 10. Jesus is stripped of His garments. 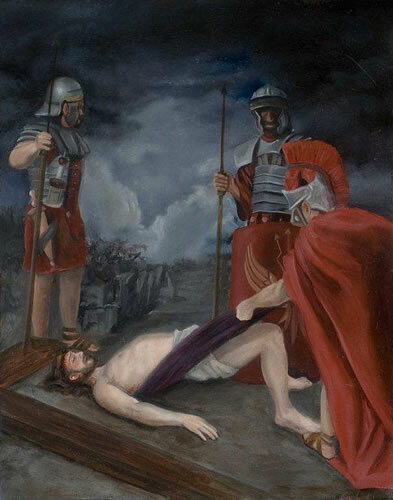 The soldiers strip Jesus of His garments. They're rough and business-like. Packers with a piece of meat and a task to be completed. They lay Jesus bare, treat Him as dead. They grab and then cast lots for His garments. // Oh Jesus, help us not to be like the soldiers, but to remain sensitive to the people around us. Help us not to be excited spectators of horrors and terrors, but let us gravitate our gaze to what is true and good, kind and worthy. Let us find You in others, and derive excitement from there. 11. 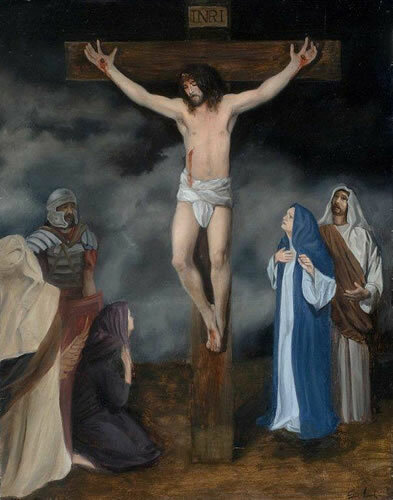 Jesus is nailed to the cross. Jesus' spirit is down to its essence and His body is nearly expired. Pain is his universe. But as Jesus told his apostles only a few days before his death, a woman in labor experiences immeasurable pain because her hour has come. The hour has now come for Jesus. 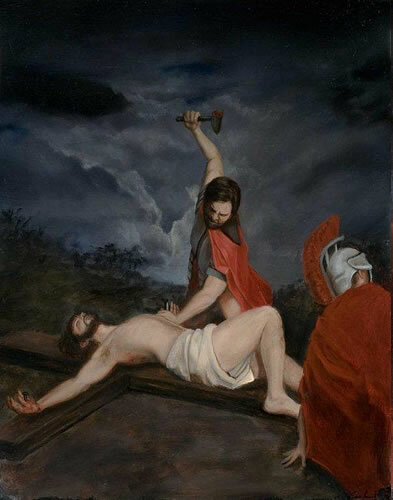 The moment has come for Him to be nailed to the cross and crucified. But like the mother once her child is born, she will no longer remember her anguish because of the joy of having brought a human being into the world. For Jesus, not only will the joy be His, but each of ours, as He redeems all His children. 12. Jesus is crucified. Father forgive them, they know not what they do. // It is finished. 13. Jesus is taken down from the cross. His body slumps, heavy, yet diminished, in the lap of His mother. Broken and abused in life, the life force is gone. 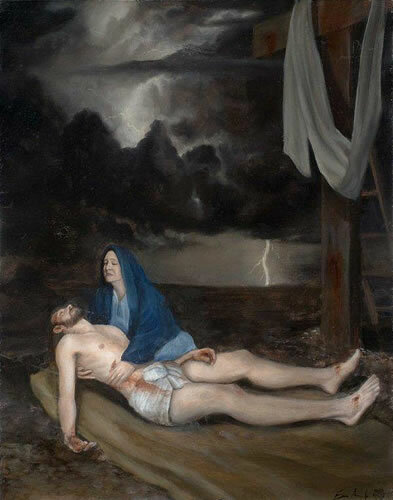 Mary holds His body, aches for Him, is glad He no longer suffers. She is proud of Her Son, but misses Him acutely. Grieving, she feels separated from Jesus' spirit, even as she holds Him. It's not easy, but again she puts her trust in God that this sacrifice will be worth Jesus' pain and her own loss. Where is Jesus now? Where is the Father? // Jesus, when You feel far away, help us to trust in Your presence and rejoice in Your sacrifice.